DRAFT Assignments. These are mock-ups of what an assignment might look like. The idea is still at the embryonic stage. 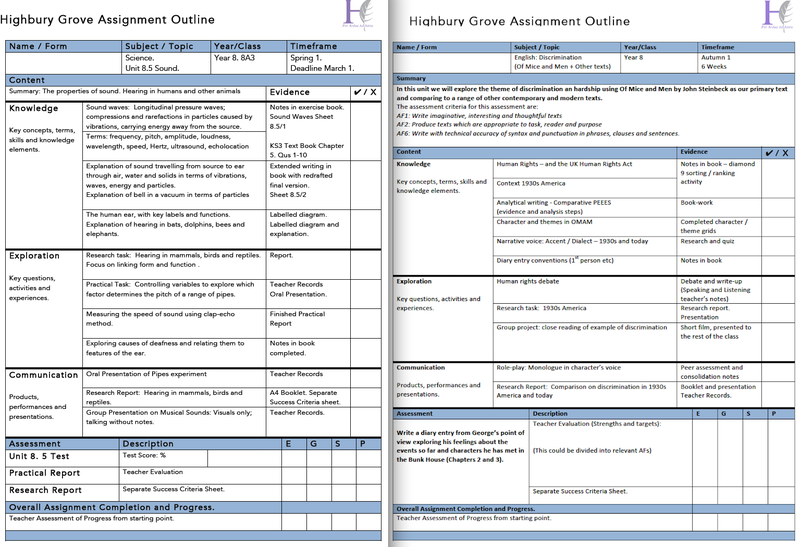 This week I pitched the idea of Assignments to the staff at Highbury Grove during a CPD session. I’ve had positive feedback from several curriculum areas so far and I’m optimistic that this is an idea that, after an evolutionary process over the next year or so, will help us to tackle lots of issues. I’m sharing it as this early stage in the hope that we’ll get feedback that might help. Add comments and suggestions below. Having ditched NC Levels at KS3, we’re using a simple Progress Grade as an interim – Excelling, Good, Some concerns, Poor. This is based on teachers’ assessment of progress from each student’s starting point. We’ve been working on the idea of producing subject rubrics that will help students, teachers and parents to make sense of these grades within each subject, linking them to standards. The problem has been one of simplicity vs depth. It’s actually really hard to write a summary rubric that doesn’t lose all the meaningful detail. So – what to do? There is also the ongoing difficulty with GCSE grades changing and the danger of talking in terms of trajectories that can be self-limiting. Using GCSE grades is too macro and leads us into the fixed mindset ‘performance goal’ trap – rather than focusing on the micro details of learning and mastery. 2. Early Intervention and learning support. I was struck by the phenomenon of the English GCSE controlled assessment catch-up sessions during the Easter holidays. Here were Y11 students who, having ducked and dived for years, were spending eight intense hours during the holidays locked-down in the process of producing extended pieces of writing. The absolute necessity for them to complete the work (now or never) finally delivered the response they needed to give. I thought ‘why can’t we get them to do this earlier’? What if we created a completion deadline structure throughout their time at school that produced this intensity on a regular basis? This echoed a discussion I’d had with members of our Behaviour Team where we agreed there was a ‘Murphy’s Law’ of intervention: the moment you decide a student needs an intervention, you feel you should have done it sooner. Related to this is the problem with supporting students with learning beyond the classroom. Parents and pastoral staff have ridiculously nebulous conversations with students about their school work. How is anyone supposed to know what constitutes ‘being up to date with the work’? If a student falls behind, how do we know exactly what they need to do to catch up – at home, in the tutor room or in the study support centre? Usually, there is a shrug of uncertainty or a sweeping brush-off – ‘I’ve done all my work’. Really? Students can drift through school, rarely properly keeping on top of what is required to achieve; it overwhelms us and we become desensitised too readily. An Assignment is basically an outline of the key pieces of work that need to be completed within a specified period of time. The idea is to have the whole curriculum – every subject in every year – described via Assignments. They don’t have to capture every detail – just the main elements of the work. ‘Being up to date’ means finishing all of the tasks within an assignment by the deadline at the standard required. The idea here is that ‘completion’ is the most basic level at which to engage students in a discussion about progress and standards. This then leads into the concept of quality, improvement, mastery and so on. But, first, do the work ! All of it. 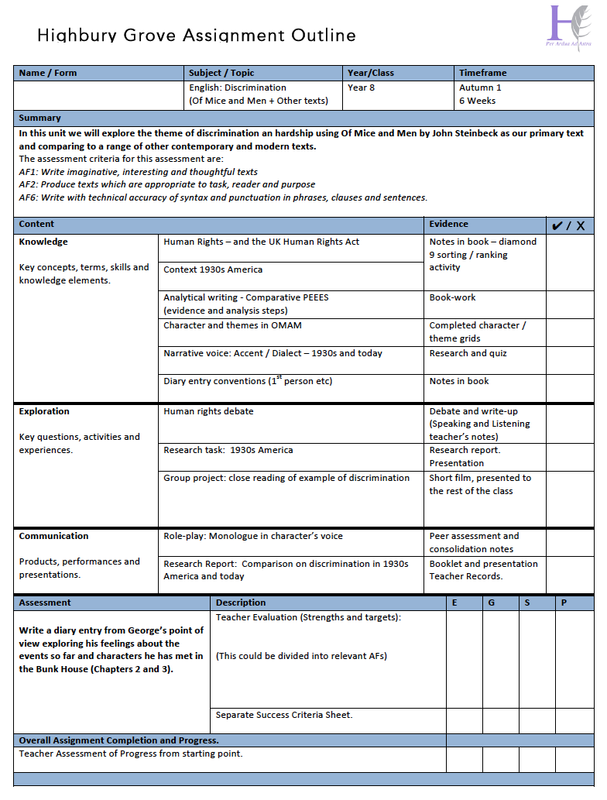 Assignment sheets can provide information to inform decisions about progress grades, defining the standards within the completion criteria. Also, given our work on the Trivium as a structure for exploring our curriculum, we could use Assignments to embed ideas about Grammar, Dialectic and Rhetoric into everything we do. Knowledge, Exploration and Communication seem to be useful terms to use to express these ideas to students and parents. Students will be set assignments of different lengths in different subjects. They could represent a half-term’s work or a term for subjects with fewer lessons on the curriculum. We could use shorter assignments at the start of GCSE and AS courses to make sure students are fully into gear, working at the right level from day one. Crucially, we will gear our intervention and study support provision around assignment completion. Students who have not completed assignments will be required to do so by attending catch-up clinics. They’ll need to generate the intensity needed throughout the school year. The goal is to engender a culture of routine hard work as students realise that lots of desperate dashes to complete assignments just in time isn’t a healthy way to live! embeds Trivium thinking: knowledge, exploration communication – ensuring that these ideas are woven into the fabric of everything we do. provides students with a guide to the work that must be done by a certain time. This can link to pre-learning material, making notes, catching up work after any absences or preparing for an assessment. gives parents and staff an overview of the content and the assessment in every subject at any given time. This is far more detailed than current curriculum overview guidance and would facilitate far more meaningful discussion. defines standards at different levels: completion of minimum requirements, quality, extension. Completion can be gauged by the class teacher, the student, parents and other staff. allows for different modes of assessment to be blended into overall assessment eg speaking, writing, practical work, oral presentation, test . 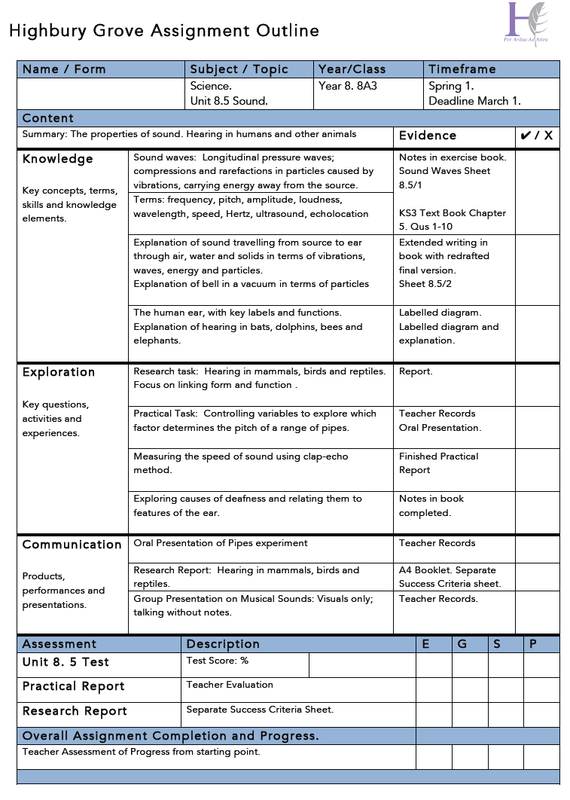 Authentic subject specific assessments can be defined as needed within any given assignment. gives parents very clear guidance about requirements for any given unit of work against which Excellent, Good, Some Concerns, Poor progress are measured. provides opportunity for different tiers of work to be assigned, within classes or between sets, so that progress is relative to the expectations implicit in the work set. provides a common language for discussing the nebulous notion of ‘being up to date’; the completion of an assignment. students can be set short-term deadlines and completion targets in all year groups; these will provide achievable short-term goals for all students and a focus for pastoral guidance instead of referring to far-off goals that seem too distant to matter now. provides a reference point for selecting students who need support to complete the work set. Non-completion of assignments would trigger requirements to attend compulsory catch-up clinics where the assignments can be finished. Science mock-up. Defines content, a range of assessment processes and the Trivium elements. This example includes a summary section. The exploration-communication division felt a bit artificial; this could be merged. The work involved in producing Assignments that really work in an authentic, efficient way in every subject is significant. We’re not going to get this right first time or overnight. I found it easier to write an assignment (the Sound example) having just finished teaching the topic. It may be that we produce the first generation of Assignments retrospectively, just before the end of each unit. Some will incorporate multiple units so we’re not chasing too many deadlines; we’re hoping that the deadlines are spread over time more or less organically but that remains to be seen. Ideally, they will be designed to make marking easier – not create massive new folders of records to keep. Again, that will take some doing. There are lots of other questions about designing challenging assignments for students with different starting points building in growth mindset thinking and top-end challenge. No small task but we’ll be taking our time. So – there you have it. Assignments! What do you think? « Processes, outcomes and measuring what we value. This is very similar to what I am working on Tom. I think it gives a more authentic learning experience for students, and will give them more responsibility for their learning. Couple this with E of E, and this could be a winning formula. – The single progress grade, from a student’s ‘starting point’. I’m not really clear what this is measuring and from when. Could you elaborate..? That’s a great question. I’m sceptical that absolute progress measures are very meaningful. Currently, it’s largely impressionistic. So, if a ‘top end’ student has G for progress it tells them there is room to go further; another student would get E for similar work because they’ve travelled further. We may have to do some work defining starting points. This could be based on Year-end assessments or other prior attainment measures. The main progress measures are in the micro detail of the learning so the grades are really overviews. As we get closer to GCSEs, we’ll probably link this more directly to outcome grades. Not sure if this helps but here’s how we’re looking at it. We’ve worked backwards from GCSE Assessment Objectives to create stages (a sort of levels)to define progress. There are 4 divided in to upper and lower because otherwise they’re too broad. Each subject then decides on the point that constitutes GCSE ready and their flight path – the start point and the end point – their LOPs remain fixed. We’re looking now to flesh out the stages statement using some statements generated by PiXL. The curriculum is now in 9 modules across KS3 and each term there is an assessment which mimics GCSE questions. This looks good, but I think you should be writing the assignments at the beginning of the planning process for a sequence of teaching; articulating what you want students to do to demonstrate their learning helps to identify exactly what you need to be teaching. Thanks Mary. That’s absolutely right. I have in mind a process where we have Outlines 90% ready at the start but allow ourselves to update them near the end so that they link tightly to what actually happened. This allows for a bit of responsive. flexibility and spontaneity. I love this idea and think it could work even in primary – in so much as sending it to the parents instead of a newsletter! It would be interesting to see as it would get them used to the idea that there is a set body of work they need to do each year – in primary the 3 year gap between KS1 and KS2 SATs can often result in children slacking off believing that it won’t be a problem until they are in Year 6. The new age-related expectations would help with this also. Some parents need to face facts in Reception that their children are behind – especially when there is no reason for it (although many ‘SEN’ are the result of neglect as much as any genetic factor). I need to mull of this. Loving this – has a lot of potential for primary as well!! I can see the advantage of this showing that everything is ‘done’ but how does it show that a student is developing from one topic to another? Using the AFs? For example, if in the knowledge part a student includes few key terms in one unit and needs to work directly on using keywords in their work, how can this be shown? And in the next topic how will they remember that that needs to be their focus? How will the sheet show that they then have/haven’t moved forward? How is there cohesion across the topics? I would assume the feedback given is also kept centrally in a teacher’s mark book and/or in a spreadsheet as well as feeding into reports. In which case, nobody’s going to forget where the student has been and where they need to go next. This is an excellent framework Tom . It something I have been giving thought to in my school,in terms of having an an overarching structure for homework , classwork , feedback and support for intervention . Many of my staff say that such a system would not give them the flexibility to go off piste or to change tack . What do you think ? Thanks Kevin. That’s a key point. I wrote the Sound mock-up based on what I did with my class; I couldn’t have written it in advance as I went off piste here and there. So – I think there are two phases: an assignment outline given out to start and then a ‘final assignment’ that captures what the teacher wants to include for the assessment and catch-up process. The last thing I want is to create a rigid system. It’s great to show the students too that you are actually expecting to go off piste. Leave at least 2 or 3 spaces where students MUST demonstrate either their own exploration inspired by the topic or their favourite or most useful learning gained off piste. This also keeps them on their toes to notice if you are digressing – makes them familiar with the scope and sequence. Maybe the inflexible thing is the medium. If the document remains editable, not everything has to be committed to in advance. Tasks can be amended, the order can change, assessment dates can be moved. What’s publishe at the start is the teacher’s ‘ideal’ flight plan. I can’t remover a time I didn’t go off-piste from the scheme of work in my class file. So what? It’s about having the confidence of your convictions. If you know it’s right for the class/student, you do it. I like this and will definitely share these thoughts to head of academics to see how this kind of assessment can be tailored to suit primary and early years as well. It makes excellent tracking! Thanks Tom. We have worked with assignments for many years now in our English dept and find it works very well. I would worry about the number of activities in the Of Mice and Men example. Deep learning could be sacrificed as teachers struggle to make sure all boxes have been ticked. Fewer activities would leave more space for drafting for improvement. This looks refreshingly creative and potentially inclusive. I did a lot of work on projects/assignments/ skills& dispositions curriculum design as a DH during a BSF project ( I even wrote a book about it). I like the dilineation of trivium key factors as a way of ensuring coverage of principles. There are strong similarities with the CSP programme here. What seems to be missing so far is a debrief of the learning. Happy to talk. Great to see this happening. The above came at a fortuitous moment in development work at my school. Simplicity always provokes great ideas. We have been working on schemes of learning and this made me realise we only need a single, assignment led document for both teachers and students. We have also added in an afl section to make it a more holistic working tool. It allows us to mirror the best of BTEC into KS3. If you would like to see my take on your idea please let me know. A slight aside from the main thrust of this post… in the science assignment, is the ‘exploration phase’ really a dialectic, or does it involve teaching the ‘grammar’ of scientific enquiry? A small point, but it’s interesting to think how we might invite students to challenge (engage critically with) what they are taught in science. This might be done through the ethics of science (as I think we did here https://www.youtube.com/watch?v=P2kzgkXkhNQ), or through questions of epistemology (what is scientific ‘truth’, what constitutes acceptable evidence etc.) . It might also be done through giving students genuinely open investigations (through links with researchers, for example). Perhaps engaging in the human stories behind science – Galileo, Darwin etc. – can lead us into bigger questions about the nature of science and its relationship with philosophy, religion etc. These things might lead us away from the set curriculum to some extent, but might also enrich our understanding of science and its place in the world. Interested in any thoughts anybody has on dialectic in science. This is a really good point. Martin Robinson is always keen to point out that the three arts form a Venn diagram; everything links. I think some experiments are firmly grammar – as you suggest. But the nature of scientific enquiry is a key area some of which ought to be experiential – the logos of dialectic. For example, burning foods to heat a tube of water has so many variables and errors – it should be delivered as the dialectic of gathering evidence rather than grammar of measuring the energy content in food – if that makes sense. I spent two weeks in the fifth form (1981!) trying to make a perpetual motion machine – linking a Wesminster kit motor to a generator and back again. Dialectic! We knew the answer but we wanted to see it for ourselves. This was part of our O level experience – unexamined, but valued. 1. In the medium- to long-term, map assignment tasks to a skills framework (PLTS or bespoke) and link that to a rewards system (Vivos or whatever you use). 2. Publish assignments on your website (grouped by year, population or subject, but easily searchable) and then promote the site/publish links at key times (social media, parent texts, or Schoop). Get that curriculum on everyone’s devices. Parental engagement makes all the difference in closing the gap. Good luck to all your staff. Tough challenges ahead, but I get the feeling they’re part of a supportive, resilient culture.